It is true to say that Flash storage is enterprise-ready, and that All-Flash Arrays are ‘the new normal’, but we need to go deeper to understand the real potential. Yes, in many cases Flash can be treated as just another tier of storage, and yes, most enterprise applications will perform better on Flash than on disk, but there is much more to Flash than that. 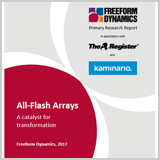 In particular, Flash works in fundamentally different ways from spinning disk, and this report is about the opportunities that arise from those differences. It is based on a recent online study of 305 IT professionals, where we met early adopters who had already realised that Flash truly can have transformational properties. However, our study also found Flash sceptics, which raised an important question: how well do people understand Flash’s potential benefits and how to exploit them? What have the early adopters learnt, what might the sceptics have missed, and how can all of us get the best from the technology?